Atopic dermatitis is common in children, but adults can develop it, too. This rash can be extremely itchy and unpleasant, but the right treatment can help. Atopic dermatitis is a type of eczema. Atopic refers to a tendency to develop allergies, although not everyone who has this rash has a problem with allergies. Dermatitis means irritated skin. Atopic dermatitis is a dry, itchy rash that may cover small or large areas of the body. It can be so itchy that it interferes with sleep, and it can be difficult not to scratch. In severe cases, the skin may crack and bleed. There may also be small blisters which contain clear fluid. It's common for the rash to have periodic flare-ups followed by periods of improvement. At first, scratching leads to reddened, raw skin and mild swelling. The skin may "weep" clear fluid, which dries to form a crust. If the rash is not treated, skin may thicken and show prominent, deep lines at skin folds like the inner elbows. This rash is most common in people with asthma or allergies, or with a family history of these problems. It often begins during infancy or childhood, although it can appear at any age. According to the Division of Biological Services at the University of Chicago, in the U.S., eczema affects about 20 to 25 percent of children between 10 and 15 years of age. Almost all cases first occur before age five, and for many people the rash goes away before they reach adulthood. Some adults develop eczema without ever experiencing the juvenile disorder. The actual cause of eczema is not known, but is a constant source of study at colleges and universities. Since eczema tends to run in families, many researchers think that the genetic component plays a role in the development of this itchy disorder. Other potential causes are faulty immune systems, which finds that certain cells are overactive or react improperly to irritants. There may also be a skin defect which lets irritants enter the skin and cause an immune reaction. Atopic dermatitis may be triggered by very warm or cold climates, or during the hottest or coldest times of year. It may be exacerbated by certain substances, including soaps and some cosmetics. Stress is another potential influence; although stress alone is not believed to cause this skin disorder, it can make it worse. For many people, over-the-counter medicines and home remedies will help. Always check with a doctor before using any treatment on babies and children. A mild steroid called hydrocortisone is available at the drugstore. It is sold in 0.5 percent and one percent creams and ointments and is usually found in the first aid aisle. Applied twice a day, this medicine can help relieve the itch and allow the rash to heal. It's important to follow the package directions, because overuse of steroids can be dangerous. Over-the-counter antihistamines may help relieve the itching. They also induce sleepiness, which can help control night-time scratching. Heavy moisturizers help protect the skin and relieve the irritating dryness. Petroleum jelly (such as Vaseline) is messy, but it is very effective for helping skin retain moisture. Many doctors also recommend Cetaphil or Eucerin creams. Tar preparations are smelly and can stain clothes, but some people find them very helpful. If tar creams and solutions are not available at your drugstore, a pharmacist may be able to make them. Avoid gels, which contain alcohol and can be drying or irritating. Once the rash is under control, simple prevention efforts can help prevent flare-ups. These tips will help prevent worsening the condition. Keep the skin moist. Use lotions, creams, or ointments designed for sensitive skin. Apply cream immediately after bathing to keep moisture in the epidermis. Avoid fragrance products. Fragrances can cause contact or "allergic" dermatitis, making the rash worse. Use gentle soaps or non-soap cleansers. Avoid wearing wool next to the skin. Wool can be irritating to [sensitive skin. Wear gloves when using household cleaners or solvents. Avoid long, hot showers and saunas. The rash is new. A doctor can confirm the diagnosis or identify a different cause. The rash worsens or fails to improve. The fluid oozing from the rash is white, yellow, green, or foul-smelling; these symptoms suggest a bacterial infection. 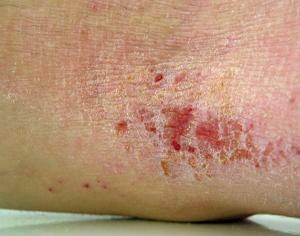 The rash has a red, raised border, which may signal a fungal infection. The skin is painful or unbearably itchy. Steroids: A doctor can prescribe steroids that are stronger than over-the-counter versions. Immunomodulators: These creams, including Elidel and Protopic, suppress certain immune system cells. They may help if steroids have failed. Antibiotics: If the rash becomes infected, antibiotics may be needed.